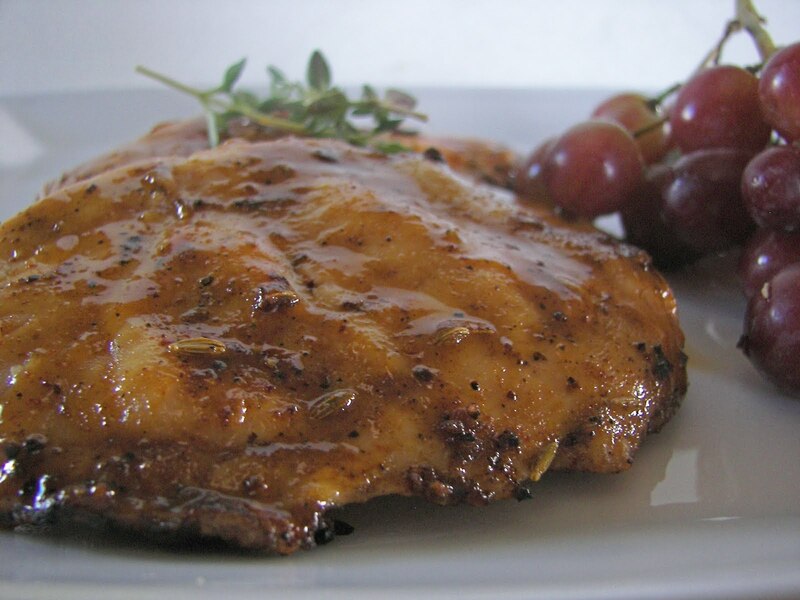 This grilled chicken recipe would be great for a Father's Day Barbecue. I said at the beginning of the week that I would be posting "on the grill" recipes in honor of Father's Day as many of the men in our life enjoy grilling. We tried this grilled chicken on the grill when we had a friend over for dinner last week. Yes, my husband did the grilling! We all liked it a lot! I liked the tangerine-honey glaze so much I could have eaten it straight! This recipe has been ever so slightly adapted from a Bobbie Flay recipe. I found it in the June 2009 Parade Magazine. It was a winner in our home. A picture of my German Thyme; I just love its scent! 2 cups of tangerine or tangerine-orange juice. Don't use juice from concentrate; I used Tropicana. 5 fresh thyme springs. 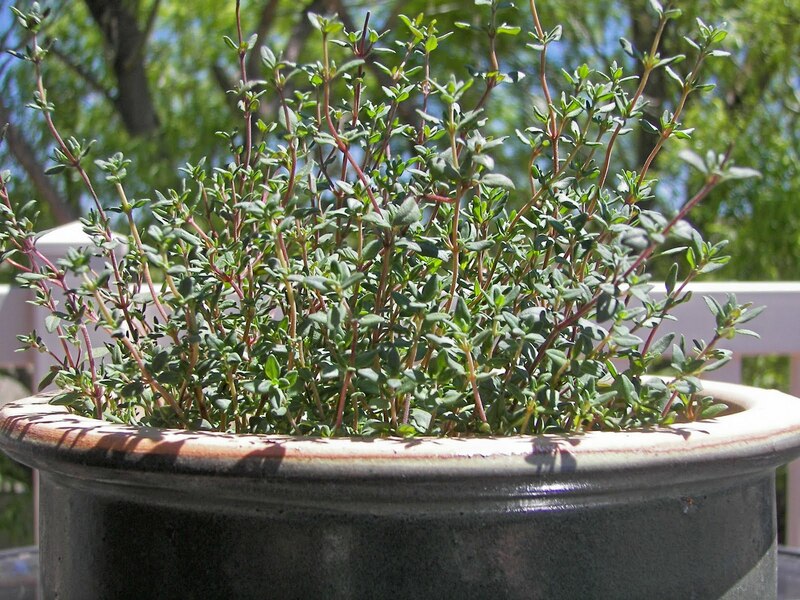 I used German Thyme because that's what I have growing. 2 tablespoons ground fennel seeds. I used fennel seeds, not ground. Combine the juice and thyme in a medium saucepan and bring to a boil over high heat. Cook, stirring occasionally, until thickened and reduced to about 1/2 cup; remove the thyme stems and discard. This does take a bit of time, but the concentrated flavor from the reduction is worth it! Whisk in the honey until incorporated and season with 1/2 teaspoon of salt and 1/4 teaspoon of pepper. Transfer to a bowl and let cool to room temperature. Heat grill to medium-high. Stir together the paprika, cumin, mustard powder, fennel, and 1 teaspoon each of the kosher salt and black pepper in a small bowl. Brush both sides of the chicken with the oil, and season with salt and pepper. Rub the top of each breast with some of the spice rub and place on the grill, rub-side down. Cook for about 3 to 4 minutes until the breasts are light brown and a crust has formed. Turn the breasts over, brush the tops of the chicken with some of the glaze, flip them, and continue cooking until done. Remove from the grill, brush the spice-rub side with more of the glaze, tent loosely with foil and let rest five minutes before serving. My husband did the grilling; I can't guarantee that he followed all these grilling steps, but nevertheless, it tasted great! I am posting this with Designs By Gollum Foodie Friday. Wow. . .what a small little bloggy world! We moved from Madison last summer to southeastern Wisconsin and we miss it so. It is a great little city! I am trying to find sucker sticks so I can make those popcorn pops you had on your blog last week. . .they looked so yummy! That looks fabulous! Love any glaze, we will try it. My blog looks like all we do is eat sweets! Your recipe looks great! I will have to try it out with Mum. I don't think we can get tangerines here so we will have to use orange juice. My guy just got home this afternoon from a back-packing trip in Yosemite. So we missed Father's Day together and are planning a belated celebration. This looks like something new and different we'd both enjoy. Thanks Joni, for so many good new ideas. I'll report back!